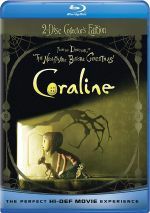 Best known as the director of 1993’s holiday classic The Nightmare Before Christmas, Henry Selick returned to the stop-motion animation genre with 2009’s Coraline. The film introduces us to Coraline Jones (voiced by Dakota Fanning), an 11-year-old whose family moves to a new home. A new old home, that is, as the Jones clan now inhabits a rather aged abode. Coraline feels frustrated, bored an unhappy with this change, as she misses her old life and can find nothing new to enchant her. Coraline’s attitude alters when she locates a bizarre bricked-up spot in the house that magically opens up at night. When Coraline enters this space, she finds herself in an alternate universe that replicates her dimension except it’s superior in most ways. Or so it seems. As Coraline spends more time in this location, she encounters a dark side that forces her to find a way back to her real home. After Selick started his career as a feature film director with the aforementioned Nightmare Before Christmas, he followed with 1996’s James and the Giant Peach, a mostly animated effort that included some live-action elements. Selick’s next flick – 2001’s Monkeybone - reversed that equation, as it mainly focused on live-action and threw in a smaller amount of animation. As Selick’s career progressed through his first three films, his movies made less and less money. Nightmare topped out at $50 million back in 1993, a sum that seemed like a disappointment given that Disney released it during their 90s resurgence. Still, that total looked excellent compared to the $28 million earned by Peach. Monkeybone completely bombed, as it took in a horrible $5 million. Perhaps those iffy financial returns explain why Selick went eight years between movies – and why as of 2019, Selick hasn’t directed another feature in the last 10 years. Coraline did better than its predecessors, but with a gross of $75 million in the US, it failed to find a major audience. It seems like a shame that Selick’s movies haven’t done better, though I can understand why mass crowds avoid them. While Selick shows a singular artistic vision, his works don’t fit easy boxes, especially since studios sold all but Monkeybone as family flicks. An animated story about a young girl seems perfect for kiddie audiences, but I must imagine that Coraline inspired many a nightmare for the children who saw it. Given that it comes from a work by fantasy novelist Neil Gaiman, this shouldn’t come as a surprise, and Selick does little to lighten the mood. Good God, does Coraline offer a dark, unsettling experience! The fact the movie got off with a “PG” rating tells me the MPAA views animated flicks as such “kiddie fare” that they barely bother to consider the actual content. Suffice it to say that Coraline follows a relentlessly ominous path. Sure, it lacks overt gore or other elements that might bump it up to a more “adult” rating, but the movie’s persistently grim feel makes it seem like something far too sinister for a simple “PG”. When Coraline meets her “Other Parents”, they have buttons for eyes, a genuinely unsettling visual. Matters get uglier from there, as the story involves snarling, giant insects, dead children and a ton of other unpleasant notions. Whew! Remember when I said I suspect a lot of kids suffered from nightmares after they saw Coraline? I may join them, as the disquieting elements on display here make this a genuinely frightening tale. While I remain unsure Coraline should’ve been marketed to youngsters, I admire Selick’s ability to portray real fright and creepiness. Most horror films rely on cheap jump scares, but Selick delivers a dark, unsettling effort that gets under the viewer’s skin in a way a million cheesy slasher movies couldn’t dream. Those elements help compensate for the less than stellar story. Much o Coraline feels loose and borderline episodic in structure, factors that don’t create a particularly firm overall narrative. However, given that Coraline really should feel like the protagonist’s dream – or nightmare – I find these concerns to become minimized. The tale may not pursue a concise path, but it probably shouldn’t. The array of visuals allows the film to immerse the viewer in its insanity and darkness. David Lynch wishes he could create material as creative and creepy! Coraline tends to over-animate its characters and it occasionally feels a little too in love with its own sense of whimsy, but those remain minor complaints. A truly unnerving horror fantasy, Coraline ends up as a winner. Coraline appears in an aspect ratio of approximately 1.85:1 on this Blu-ray Disc. A stunning image, the movie looked amazing from start to finish. Sharpness excelled, as not a single moment looked less than ideal. The film came with terrific definition and accuracy. I saw no signs of jagged edges or moiré effects, and edge haloes remained absent. Print flaws failed to manifest themselves as well. Much of Coraline opted for a fairly blue orientation, and in the “real world”, these tones tended to match the drab setting. Colors became more dynamic in the “other realm”, though, and they appeared as vibrant and bold as they needed to be. Blacks came across as dark and dense, while shadows offered nice smoothness and clarity. I felt completely pleased by this amazing presentation. While not as impressive, the film’s DTS-HD MA 5.1 soundtrack served the story well, especially in terms of ambience. A creepy movie deserved a creepy soundfield, and the mix used the various channels to form a moody setting for the tale. During more action-oriented scenes, the track opened up well and created a vivid sense of the material. Expect a fairly immersive soundscape to emerge here, and music showed nice involvement as well. Audio quality worked fine, with natural, concise dialogue. Music showed appealing range and clarity as well. Effects offered nice reproduction, with elements that seemed accurate and deep. Bass response worked well, as low-end provided tight, warm tones. This turned into a more than satisfactory soundtrack. As we shift to extras, we find an audio commentary from writer/director Henry Selick. Though the package credits this as a track from both Selick and composer Bruno Boulais, that doesn’t work out as implied. Selick talks over almost the entire movie, and Boulais offers a few thoughts during the end credits. During his running, screen-specific commentary, Selick looks at the source and its adaptation, story/characters, cast and performances, music and editing, shooting 3D, stop-motion animation and puppets, various effects, and connected domains. For his brief chat, Boulais tells us a little about his work. Boulais’ remarks add a few nuggets, but he shows up for only about five minutes, so he gets too little space to tell us much. That leaves this as Selick’s party. And we’re all invited! Selick covers the film in a thorough, detailed manner that brings the project to life. Selick gives us a simply terrific view of the project and makes this an excellent commentary. A documentary called The Making of Coraline fills 35 minutes, 56 seconds with notes from Selick, author Neil Gaiman, art director Tom Proost, character fabrication supervisor Georgina Hayns, animator Jeremy Spake, lead hair and fur fabricator Suzanne Moulton, lead costume design fabricator Deborah Cook, art director Bo Henry, “Fantastic Garden” art director Matt Sanders, set dresser Bridget Phelan, supervising animator Anthony Scott, lead animators Phil Dale, Travis Knight and Trey Thomas, animator Suzanne Twining, VFX supervisor John Allan Armstrong, senior compositors Patrick Wass, Peter Vickery and Aidan Fraser, director of photography Pete Kozachik, and actors Dakota Fanning, Jennifer Saunders, Teri Hatcher, Dawn French, and John Hodgman. “Making” looks at story and characters, the source and its adaptation, character design and art direction, cast and performances, puppets, costumes, set design/creation, animation, effects, and the film’s use of 3D. Across its chapters, “Making” delivers a nice overview of the production, one abetted by ample behind the scenes materials. Those give us a fine look at the various techniques and help make this a worthwhile program. Two featurettes follow, and Voicing the Characters lasts 10 minutes, 46 seconds. It offers info from Selick, Fanning, Hatcher, Hodgman, Saunders, French, and actors Keith David, Robert Bailey Jr., and Ian McShane. As implied, “Voicing” looks at cast and performances. It adds to that part of “Making” and becomes a fun look at the recording studio. With the five-minute, three-second Creepy Coraline, we hear from Selick, Fanning, Hatcher, Hayns, Cook, animator Juliana Cox and mold maker Matt Duron. “Creepy” discusses some of the movie’s ickier moments and their creation. It turns into another informative piece. Six Deleted Scenes take up a total of eight minutes, 37 seconds. In truth, only four offer actual “deleted scenes”, as the final two go down other paths. “Ribbon Mice” shows the animation that appears after the end credits, and we also get a montage of short cut snippets that don’t evolve into real “deleted scenes”. As for the other four, three concentrate on Coraline and her real parents, while the fourth shows her with the ghost children. All seem interesting but not especially useful, especially since the added scenes make Coraline’s real mom seem even more unpleasant. Note that the running time includes introductions from Selick. He tells us about the unused material and why it didn’t make the film. Selick presents good information, but the editing style annoys, as the disc’s producers create a strange, off-putting alternative to the usual “talking head” elements. 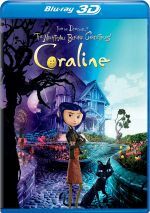 A second disc presents a DVD copy of Coraline. It includes the commentary but lacks the other extras. An effective mix of fantasy and horror, Coraline becomes an involving effort. 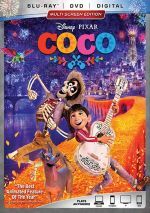 With excellent use of stop-motion animation, the movie creates a vivid world. The Blu-ray brings excellent picture as well as very good audio and a nice collection of supplements. Coraline stands out as a winner.